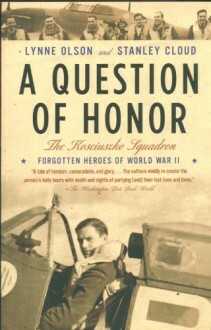 A Question of Honor is the gripping, little-known story of the refugee Polish pilots who joined the RAF and played an essential role in saving Britain from the Nazis, only to be betrayed by the Allies after the war.After Poland fell to the Nazis, thousands of Polish pilots, soldiers, and sailors escaped to England. Devoted to liberating their homeland, some would form the RAF’s 303 squadron, known as the Kosciuszko Squadron, after the elite unit in which many had flown back home. Their thrilling exploits and fearless flying made them celebrities in Britain, where they were “adopted” by socialites and seduced by countless women, even as they yearned for news from home. During the Battle of Britain, they downed more German aircraft than any other squadron, but in a stunning twist at the war’s end, the Allies rewarded their valor by abandoning Poland to Joseph Stalin. This moving, fascinating book uncovers a crucial forgotten chapter in World War II–and Polish–history.